The item gets selected and the user can move it around the screen by holding on to it. When the user releases the item on an empty spot, the item is located there. The spot where it was before, is now open. It is also possible that the item changes position with an other item. 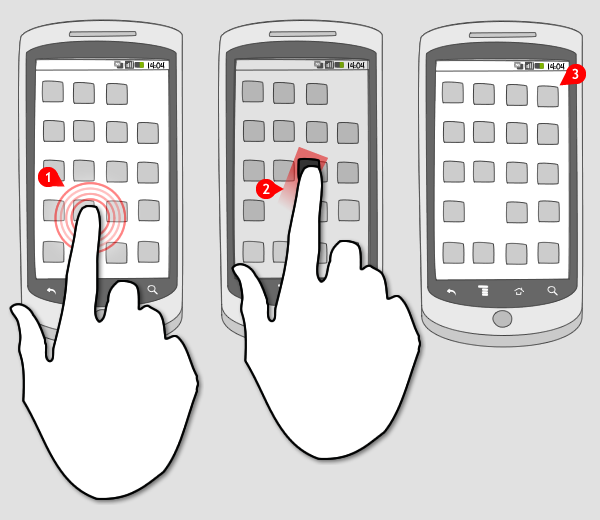 The drag to move gesture can be used when the user must be able to move objects around the screen. For instance to alter the order of a music playlist, to (re)arrange the home screen, or to enter a value using a slider. 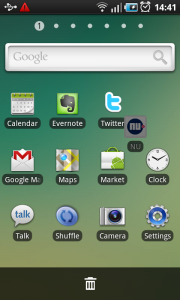 1 The home screen of Samsung's Galaxy S shows 4 rows of application icons. The bottom row contains icons that are located in an permanent spot. The top 3 rows, and the google search bar are placed there by the user, and can be changed. 2 When the user performs a longpress on an item, it is selected and it can be moved around the screen. The bottom row of application icons is replaced by a trash can. The user could get rid of the application from the home screen by dragging the icon to the trash can area. 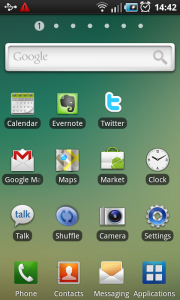 3 When the user moves the icon to the second pane of the home screen, it is still in a selected state. 4 Releasing the icon on the empty spot, will place it there. The bottom row of applications is again visible. 5 And the spot where the icon was previously positioned is now open. 1 An icon at the end of each item indicates that the music playlist is in the 'change order' mode. 2 Tap and hold on an item, and the user can drag it to a new position in the list. 3 Releasing the item, and it is positioned in a new spot. Here the next one. For the Sony Ericsson Xperia Arc you can’t press/hold and drag items around. As well, you can’t press/hold and drag into the trash (it will just bounce back and be put back in the place it originally started in). Can I get the code for dragging text up and down..
My tab is pattern luck what to do ? hello. do you publish working codes for this?